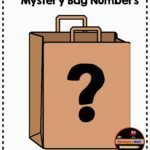 Are you looking for new ideas for hands-on Fall math activities? 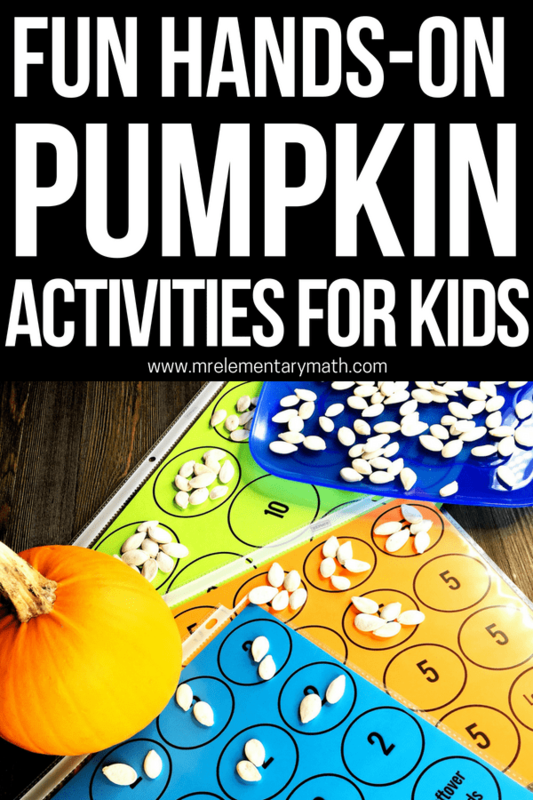 Look no further, I have a great math activity just for you, Pumpkin Math Investigations! 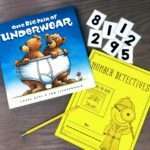 Using read-alouds to teach math concepts is a great way to engage our kids. One of my favorite Fall math books is How Many Seeds in a Pumpkin? In this book, a classroom of students guess how many seeds are in a pumpkin. This is the perfect set up for a math activity. With that said, let me share Pumpkin Math Investigations! – Book – How Many Seeds in a Pumpkin? This activity is intended to last a couple of days, moving from whole group to small group lessons. 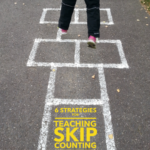 Each lesson is focused on grouping, skip counting, comparing numbers and addition. So let’s get to the math! 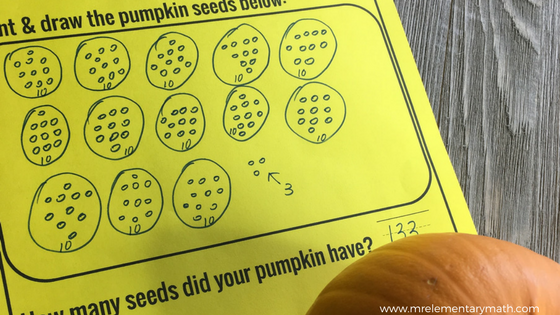 Read How Many Seeds in a Pumpkin? and ask questions. Tell your kids that you bought in a pumpkin, like in the story and you want them to guess how many seeds are inside. 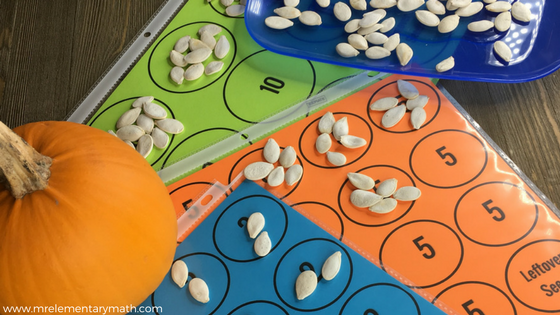 Have students guess the number of pumpkin seeds and record the responses. 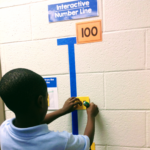 Write initials next to the number that students guess. Next, remove the top of the pumpkin and scoop out the seeds with a spoon. To get all the seeds you will probably have to use your hands. It’s messy, but fun! Let your kids see the pumpkin seeds on a plate and ask them to now estimate the number of seeds on the plate. Ask if anyone wants to change their guess. Revise student answers to reflect any changes. Teacher Tip – Let the seeds air dry, but do not leave them on a paper towel because they will stick. I learned the hard way! Once the seeds dry, count the number of seeds using the different grouping mats. Model skip counting on each mat and adding the leftovers. Record the total number of seeds on a chart. Have a discussion by comparing the estimations and the total amount of counted seeds. Write addition equations that represent the seeds on the counting mats. 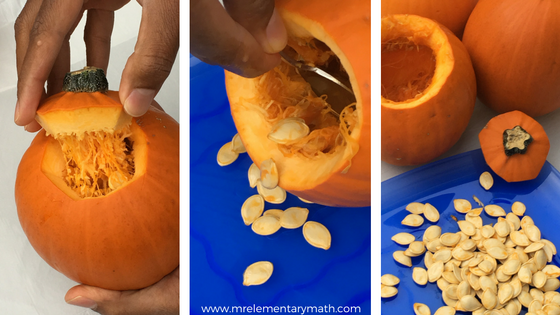 Tell students that they are now going to work in groups to find out the amount of seeds in their pumpkins. 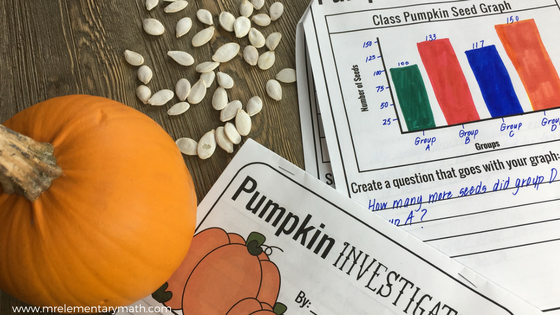 Use the Pumpkin Investigation FREEBIE so that students can record their work. Teacher Tip – For time’s sake, if you want to skip the part where kids scoop the seeds out a pumpkin, use prepackaged pumpkin seeds instead. Place the seeds in a brown paper bag and ask your students to estimate the number of pumpkin seeds in the bag. Watch my video for more details and don’t forget to download the Pumpkin Investigation FREEBIE.